The band - Michael Knowles - Guitar/Lead Vocals, Jamie Gilchrist - Guitar/Backing Vocals, Robbie Gilchrist - Bass Guitar, Dando Myrillas - Guitar and Greg Atkinson - Drums all grew up together in North Edinburgh and have been the present line up for over a year now. They got together through their mutual love of early 2000's bands Arctic Monkeys and The Strokes and also their main influences The Yardbirds, The Kinks and The Who. Since forming, the band have been playing various venues throughout Glasgow and Edinburgh including Sneaky Pete's, Cabaret Voltaire, Electric Circus, QMU & Ivory Blacks where they have caught the eye of several promoters. 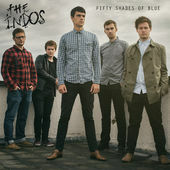 'Fifty Shades of Blue' was written and composed by The Indos and recorded, mixed and mastered by Mark Morrow in his Edinburgh studio in August of this year.